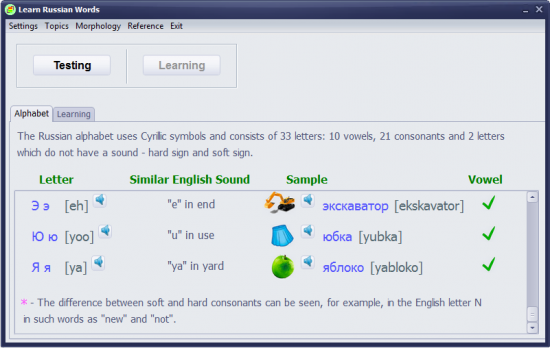 Direct Download Learn Russian Words 6.0. The program is for effective and quick studying of Russian words. In comparison with ordinary training method with dictionary, the training of the «Learn Russian Words» program allows to speed up the memorizing of new words. With it help you quickly learn all volume of the most frequently used Russian words (more than 2000). In the course of training the program offers to users 4 types of testing and 2 types of learning (alphabet and words). At the same time this training program stimulates at once several perception channels of learner, maintains his attention much better, aids to reduce fatigue and provide necessary relaxation. Due to combination of text and sound row there are great opportunities for complex development of foreign language speech skills.